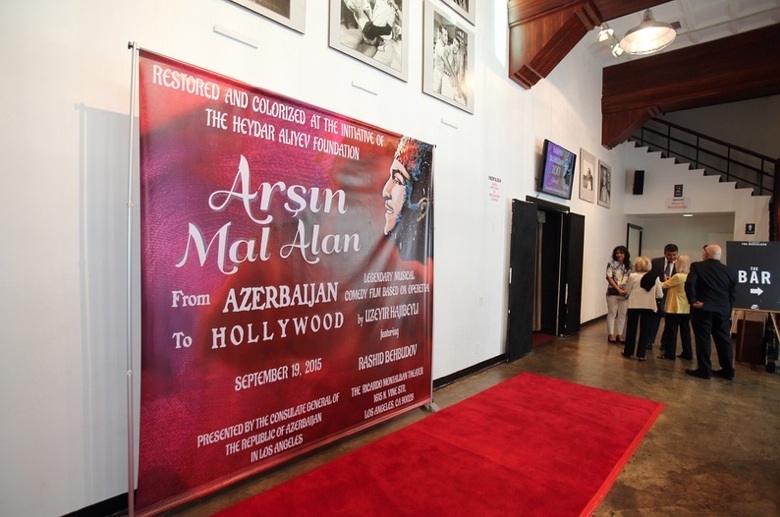 One of the most famous Azerbaijani movies - Arshin Mal Alan (The Cloth Peddler) was successfully shown on September 19 in Hollywood. Shot in 1945, this was the first-ever screening of the legendary musical comedy film in Hollywood. The screening was presented by the Consulate General of Azerbaijan in Los Angeles. The iconic movie, which has already been shown in 136 countries in 86 languages, was re-mastered and colorized in 2013 in Los Angeles at the initiative of Azerbaijan’s Heydar Aliyev Foundation. Namely, this new version of the film was screened at Hollywood’s renowned Montalban Theater – the first fully automated theater in America. “Arshin Mal Alan” is based on the operetta of the same name by great Azerbaijani composer Uzeyir Hajibeyli. The operetta is regarded as the first operetta in the Muslim world. The screening was dedicated to the 130th anniversary of Uzeyir Hajibeyli, 100th anniversary of the film’s main character, legendary singer Rashid Behbudov, and 70th anniversary of the film. Welcoming the audience, Azerbaijan’s Consul General in Los Angeles Nasimi Aghayev informed the attendees about “Arshin Mal Alan”. Mentioning the fact that in 2001 Azerbaijan’s National Leader Heydar Aliyev advised the film to be restored to its original quality, Aghayev invited the audience to watch the said speech. Then the video of Heydar Aliyev’s speech was shown. Aghayev further noted that this advice of the national leader was fulfilled when the film was colorized and re-mastered in 2013 at the initiative of the Heydar Aliyev Foundation. He said this enormously important project gave “Arshin Mal Alan” a new life. Speaking of the Heydar Aliyev Foundation, Aghayev highlighted the various cultural projects implemented by the Foundation under the dynamic leadership of Azerbaijan’s First Lady Mehriban Aliyeva, in Azerbaijan and abroad, for the promotion of Azerbaijani music and culture. Noting the fact that September 18 is Uzeyir Hajibeyli’s birthday, Nasimi Aghayev expressed his gratitude to the City of Los Angeles as well as to six other cities in California for proclaiming this date as the “Uzeyir Hajibeyli Memorial Day” in their respective cities. Speaking of Azerbaijan’s legendary singer Rashid Behbudov, Aghayev said Behbudov’s beautiful voice and great acting played the vital role in the success of the movie “Arshin Mal Alan”. Then daughter of Rashid Behbdov, Rashida Rashid, who visited Los Angeles to attend the screening, was given the floor. In her remarks, Rashid shared the memories of her father about the film. She thanked the Heydar Aliyev Foundation for this wonderful accomplishment and called it a great contribution to the preservation of Azerbaijan’s cultural heritage. She characterized the screening of “Arshin Mal Alan” in Los Angeles – the center of the global film industry – as an event of historic magnitude. Afterwards the floor was given to the individuals who played a direct role in the colorization and re-mastering of the film: Igor Lopatonok, CEO of Global 3 Pictures; Price Pethel, visual effects specialist, Oscar Award winner in 2002; Jane Hicks, art director for films by many Hollywood companies including Sony Pictures and Walt Disney Studios. The speakers expressed their immense satisfaction of being part of these projects and stressed the importance of “Arshin Mal Alan” for the world culture. Then the movie was screened. Once again, “Arshin Mal Alan” easily won hearts and minds, mesmerizing the audience with its witty plot, amazing music, great singing and flawless acting.